Don’t you wish you could start your life backwards? It’s one of those situations where you accumulate all this experience and knowledge which you may never have the opportunity to use again. Instead, you have to learn these life lessons the hard way! The answers and wisdom come after you run that first marathon, get that black belt, or climb the highest mountain in your life. About 9 months ago, I wanted to have a unique and once-in-a-lifetime Birthday Party to commemorate my ½ century mark. Since I love travel and family trips, I was craving that-trip-of-a-lifetime -an African Safari. We settled on a trip to Tanzania, but since our family has a voracious appetite for adventure, we needed a bit more activity than weeks sitting in a jeep following around exotic animals. 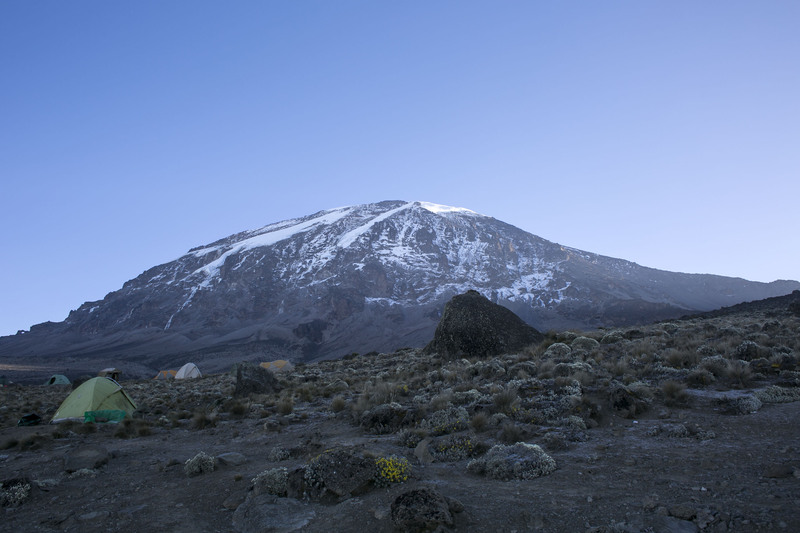 With our passion for the outdoors and hiking, we booked a 7 day trek to Mt Kilimanjaro, where booking the trip was the easy part! The hard part was the preparation for high altitude, extreme cold, and sleep deprivation. Training meant more than just our outtake of getting into hiking shape, but we needed to focus on our food intake, as well. With a 33 pound weight limitation, we put more of a priority on what we ate on the trail than what we would wear on the trail. All leftovers can be eaten on the Safari part of the trip or on the long airplane ride home! The food can be a bit bland, so bring your favorite hot sauce and/or seasoning. Breakfast: Expect to eat Porridge, White Toast, Omelets, Sausage/Bacon, Pineapple or Mango Juice, Bananas, Tea, Instant Coffee (not very good), Milo (a Nestle’s product with high amounts fiber!!!) every morning. You drink enough Milo and it acts as a laxative! Lunch: This was our hardest meal, and the food became quite tasteless after a few days. We were given Pineapple Juice, a Banana, a bitter orange, a white bread sandwich with jelly/jam (with an alcoholic taste) or bland cheese, a scrawny chicken leg or wing (if we were lucky), a dry biscuit or cookie. Having snacks from home will be a necessary supplement or replacement for lunch. Dinner: Soup, rice, vegetable dish, beans, beef, or chicken (stew or wings). The hot sauce from home spiced up the meal. Some suggestions on how to best prepare for the outtake or training for a Mt. Kilimanjaro Trek. Put extra weight, like a dumbbell or so. Our goal was to have 20-35 pounds in our pack. Try to go to the highest altitude for a weekend of intense hiking. We chose Mt. Whitney at 14,455 feet. We camped one night and hiked 22 miles the next day, which took us 16 hours. Our Whitney trip got us mentally prepared for all aspects of our Kili trip. Medication: 3 out of 4 of us took Diamox to help prevent altitude sickness. The one member of our family who didn’t take Diamox barely made it to the top and had severe altitude sickness. Conclusion: Diamox seems to work. Sleeping Survival: A comfortable inflatable camping mattress pad (helps with your sleep, prevents back pains, and keeps you warm at night), small portable pillow with pillowcase, and sleeping bag liner for the Lemosho Glades Route (Whiskey Trail). Clothing Items: An 800+ down-filled jacket with a hood and layers of fleece, thermals, wicking (long/short) shirts, glove liners, warm gloves, sock liner, wool socks, sturdy high top hiking boots, rain gear, hiking pant(s), gators (wear them to keep your socks and legs cleaner), ski hat, buff, glove/foot warmers, sun hat, and sunglasses. Appreciated: Baby wipes. We brought a small package and used them to occasionally wipe down at night in our tent. The meal before our ascent consisted of a snickers bar, boxed pineapple juice, breakfast beverages, and a dry cracker like biscuit…clearly inadequate calories, so we were saved with our gels and power bars. Plan on eating a few power bars, gels, a package of electrolytes, and constantly sipping on water from the pack (though we got winterized drinking tubes for the packs, expect that it will most likely freeze as you approach the top). The pace is excruciatingly slow, and as you gain altitude, your body and extremities get cold. Wear more layers than you think because you will not warm up on the trails until the sun comes up. The Kilimanjaro Diet is about bringing what you need to make it through this difficult journey and leaving the comforts at home. At 50, I found my Mountain of Youth on this 7 day trek up Kilimanjaro.